Speak again, Cordelia: One can never be too old for Hello Kitty. 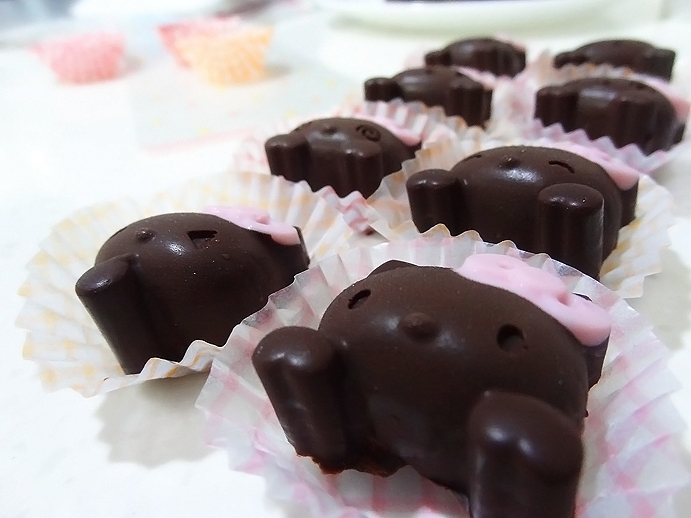 One can never be too old for Hello Kitty. 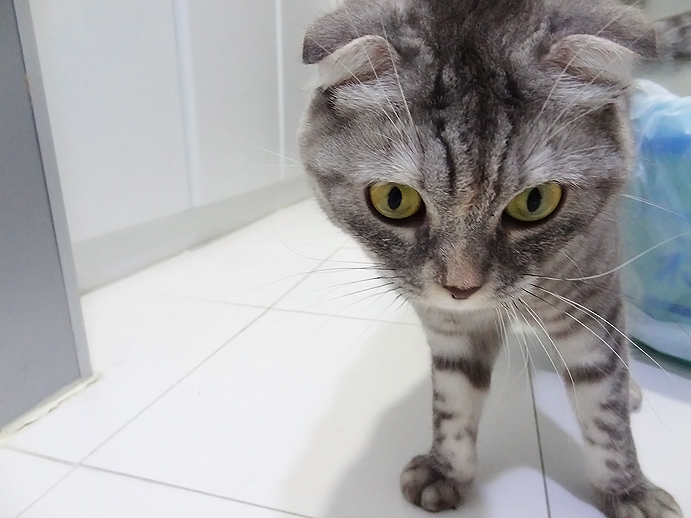 Hello wonderful people from all over the world, I'd like to wish you a Happy Valentine's Day! I hope you are spending it thinking about the people you appreciate and love very much. 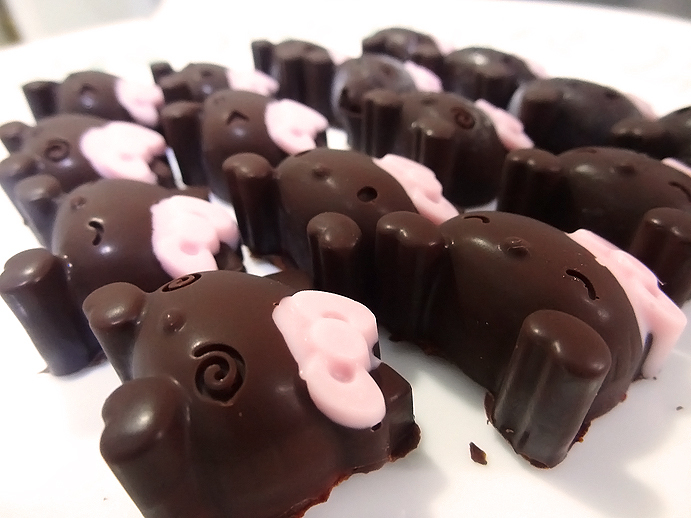 Every year around this time of the season, I use Valentine's Day as an excuse to experiment with chocolate. I recommend trying chocolate recipes for those of you who aren't very good at following instructions--you can't go wrong with chocolate, it'll still taste good even if the result doesn't turn out to be what you had set out to make it. Chocolate is chocolate. 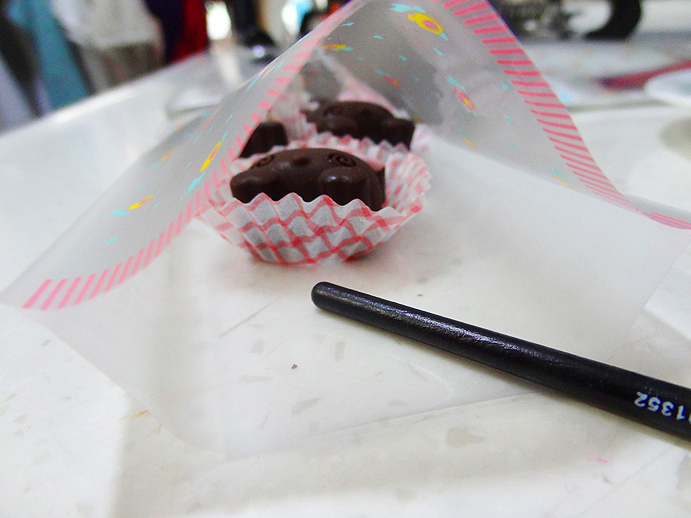 In the past few years, I've made plain, round truffles (which are still very good and fun to make, by the way) rolled in cocoa powder as a finish. 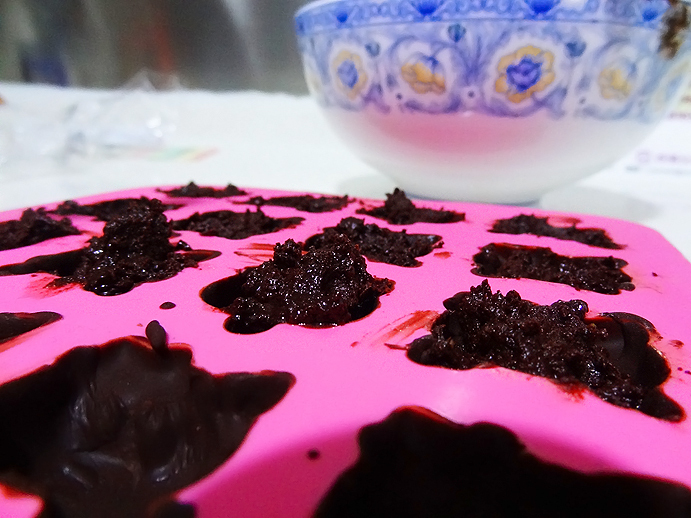 But this year, I decided to try a new recipe that involves making a red wine ganache first before making the outer layer of the truffle with a mold. 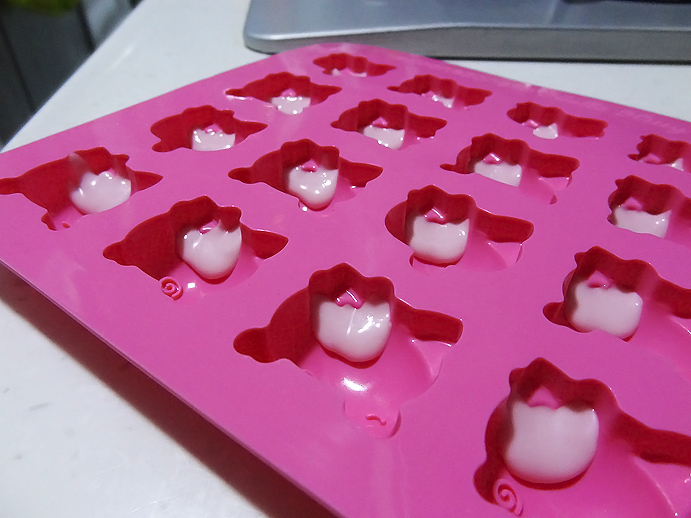 It just so happens that while shopping with a friend some weeks ago, I came across a super cute Hello Kitty silicone mold, so snagging it right away (can't be helped, it was pink), I just couldn't wait to try it out with this year's batch of chocolates. And despite a few setbacks due to a terribly useless wine bottle opener and some broken china, luckily, it seems the chocolates were a success! I followed the outlines of a recipe I found online but here is how the general process of my truffles went. 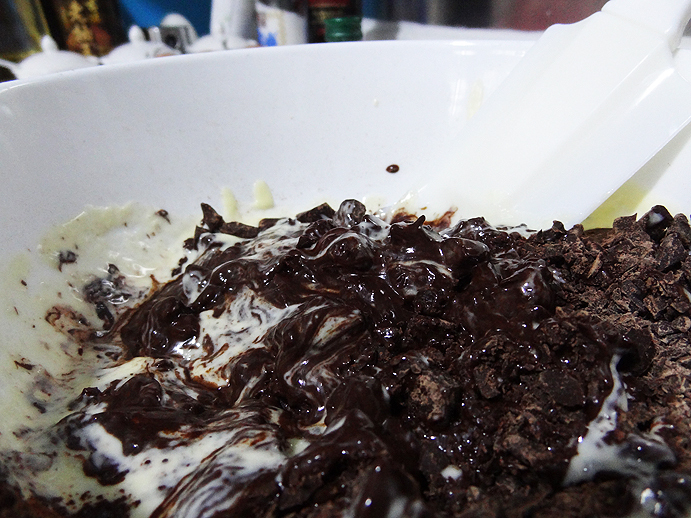 I finely chopped up a bar of dark chocolate, briefly heated some heavy cream and poured it onto the chopped dark chocolate, mixing it until all the chocolate melted. 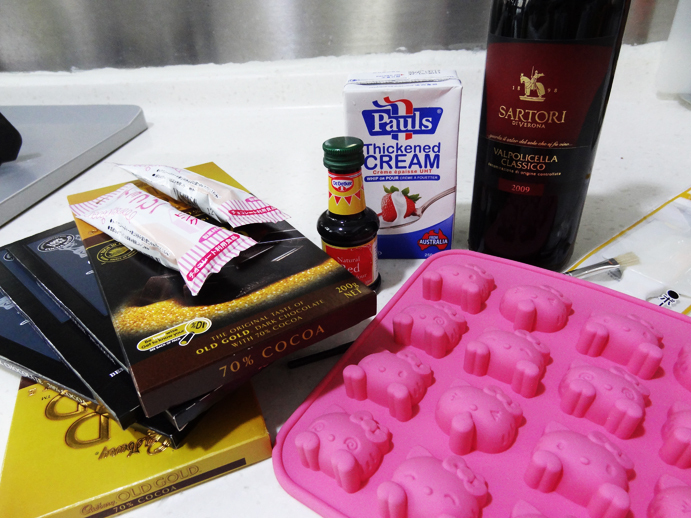 Then I added a few tablespoons of red wine and a bit of red food colouring. I put the concoction in the refrigerator for a couple of hours. 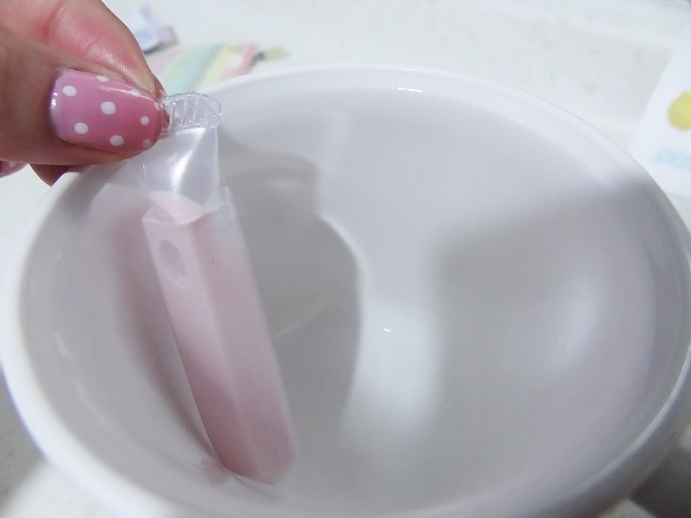 I had bought two pink "chocolate pens" that were filled with light pink-coloured chocolate. 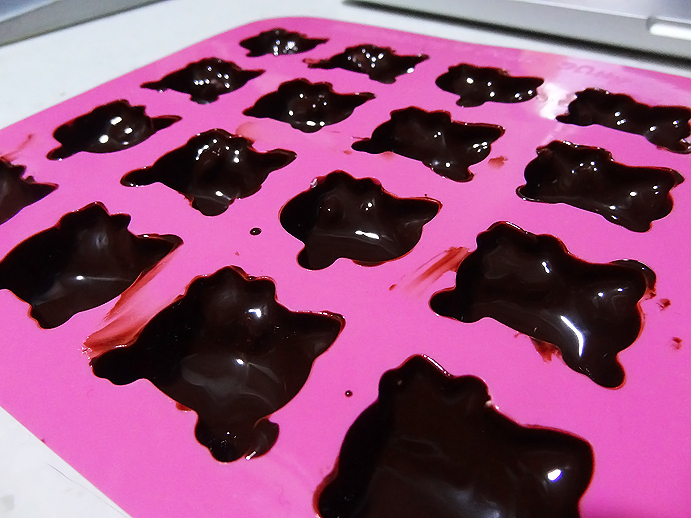 I softened the chocolate in a cup of warm water before cutting the end and filling the bow part of the Hello Kitty molds with pink chocolate. 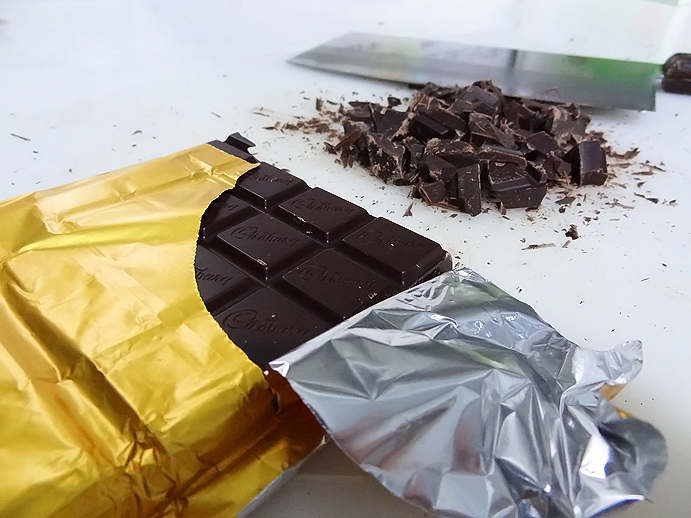 You can probably easily do this even without a fancy chocolate pen. Mix a drop or two of red food colouring with white chocolate and just apply with a small spoon (or piping bag if you insist on being at least somewhat fancy). I know it looks kind of like the disgusting globs of chewing gum your fingers sometimes come across on the underside of old school desks, but try not to think of it that way. 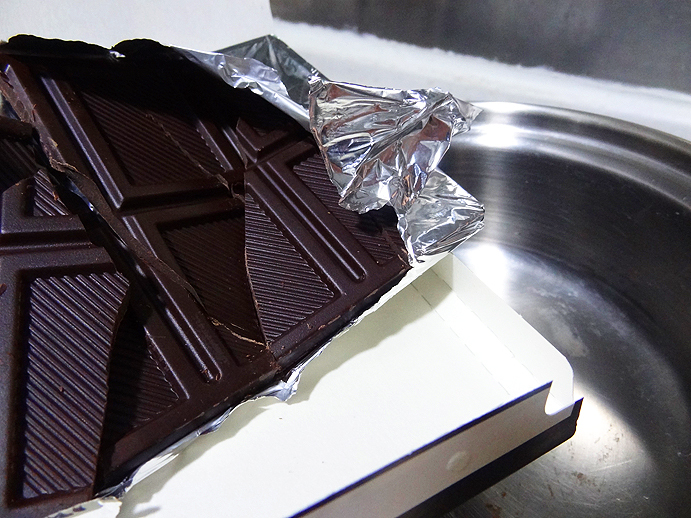 A while later, I broke up another bar of dark chocolate and heated that on the stove until it melted. 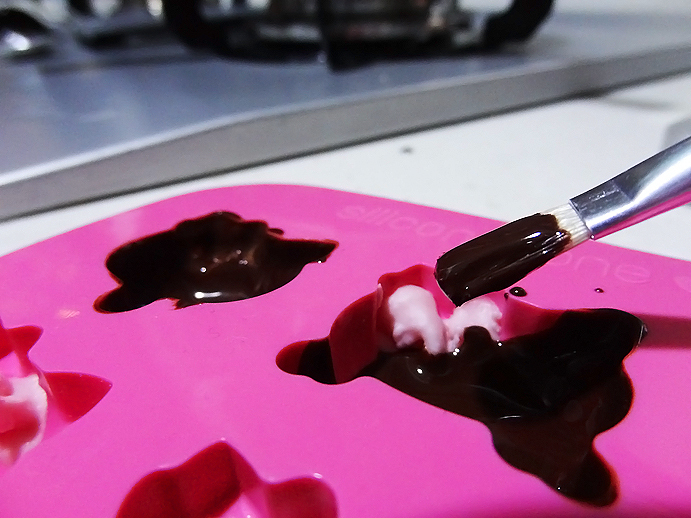 Using a brush, I painted the sides of the silicone mold with the melted chocolate. 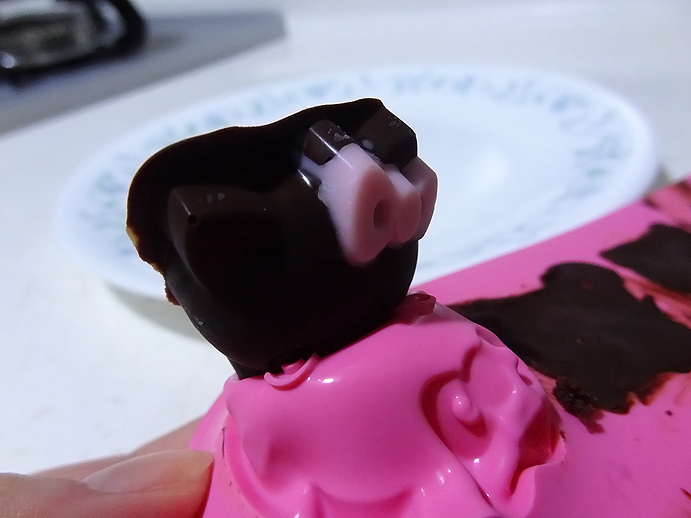 I put the entire mold in the freezer, took it out again to double coat the molds with chocolate, and put it back in the fridge before finally filling it with the ganache. 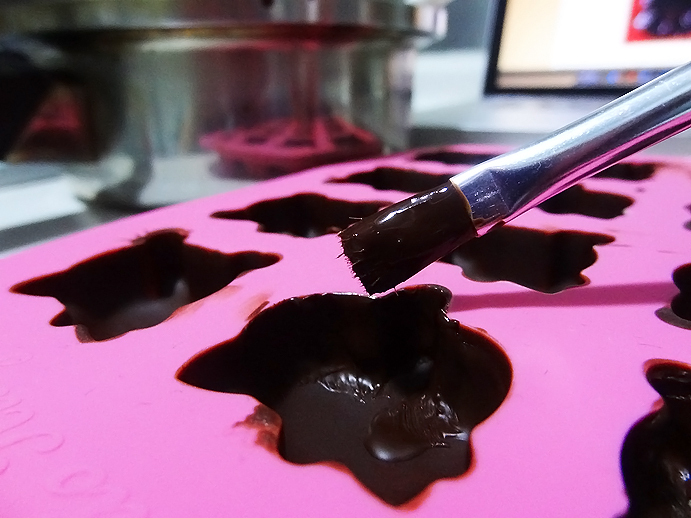 I stuck the filled molds in the freezer again before sealing off the truffles by adding the rest of the newly melted dark chocolate on top to complete the bottom. 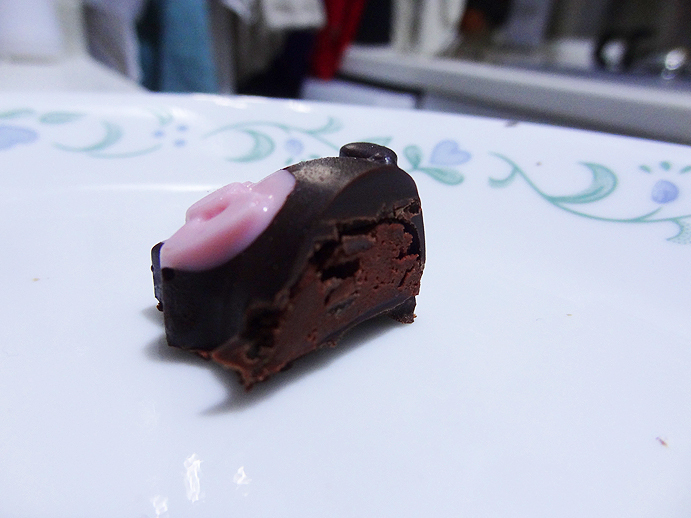 I left the truffles in the freezer overnight for the chocolates to set, and in the morning I slowly removed the truffles from the mold by pushing upwards... and breathed a huge sigh of relief when I saw that it actually worked--and looked nice too! I tried one myself since I didn't want to be giving away death chocolate, and fortunately, it tasted just fine! Wrapped it up nicely with some fancy packaging and shiny boxes, and off they went. Regardless of each person's chocolate preferences, at least they're quite nice to look at this year, so that's a +1! 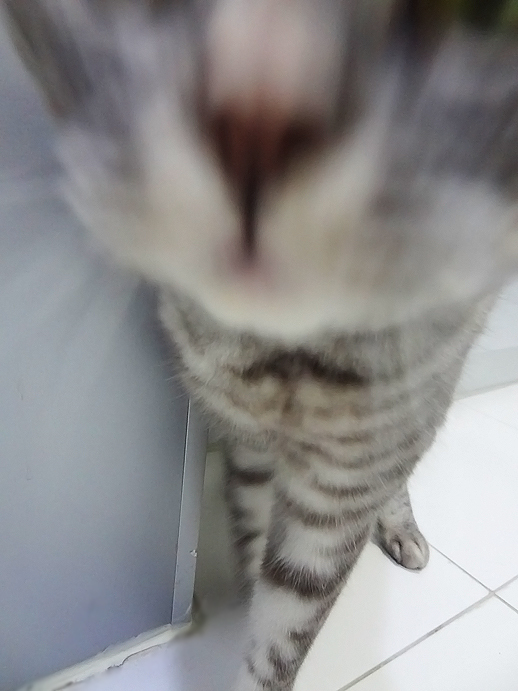 On a side note, our resident kitty was preying on her chocolate counterparts when I was making them in the kitchen. Sadly for her (but fortunate for her health), she didn't get any in the end... so instead, I'll just feature her at the end of this entry. 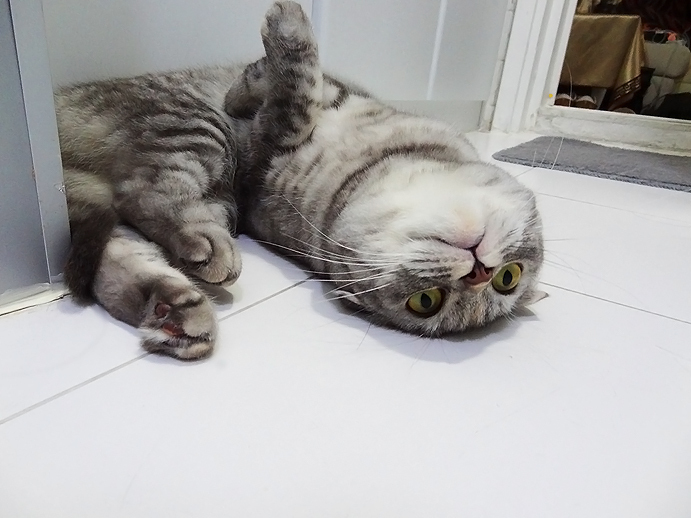 I'm not a fan of cats, but apparently most people are, so here you go! And don't forget to rest well tonight so you can dash off to the store early next morning and stock up on even more chocolate... when all of it is 50% off! You should update more :) ♥ Love your photos and writing. I remember going to buy the stuff with you last year. lolll Can't believe it's already been a whole year... Looks like they turned out really well! Awww yes, such good times! I really can't believe it's been a whole year... I'm thinking of trying a chocolate cake instead of truffles this year.